Her name is Alanna Almstead. She’s a librarian at Ichabod Crane in Valatie, NY. And at the end of each school year, Alanna faces the same vexing problem: Unreturned library books. Because kids tend to forget. And some others, let’s hope, just fall in love with that book and can’t stand the thought of letting it go. Alanna realized that the problem might be solved if she could only provide the proper motivation. Some sort of incentive. A carrot, so to speak. 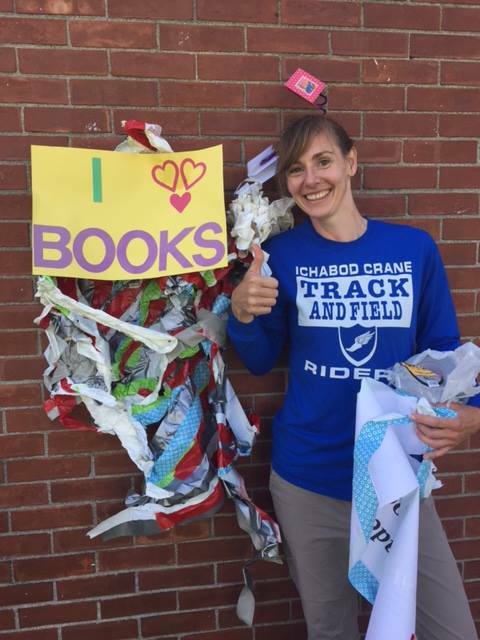 “The idea actually came about last June as my amazing aide, Lori, and I were discussing the shameful number of missing books at the end of the year. Always eager to see me make a fool of myself, I think the words “duct tape” first came out of her mouth. Fast forward to May of this year. There I sat rambling at the end of a particularly fun library class about how important it was to return their books (we also give funny trophies to the five classes that return all of their books the fastest) when I suddenly blurted out that if the whole school brings their books back I would get taped to the wall. Yikes! Once that sort of thing gets said there is no taking it back, but no worries… It will never happen, I thought to myself. I approached my principal, Suzanne Guntlow, after the fact. Suzanne is a wonderful supporter of the library and gave me her blessing, just in case the kids came through. And come through they did! Although we fell short of the goal of all books returned school wide I am very happy with the results. In the end we had only 12 books still checked out in a building serving over 560 students. When the last third grader brought her book back I knew that I would have to make good on my promise. And so, on the eve of the last day of school, I found myself making the rounds to several local stores to buy armfuls of duct tape. Variety seemed important, for some reason. When you’re nearly 6 feet tall and are faced with getting stuck to a wall you want the tape to work (and look pretty, of course!). Final comment: I think it’s pretty obvious what they think of you, Alanna. 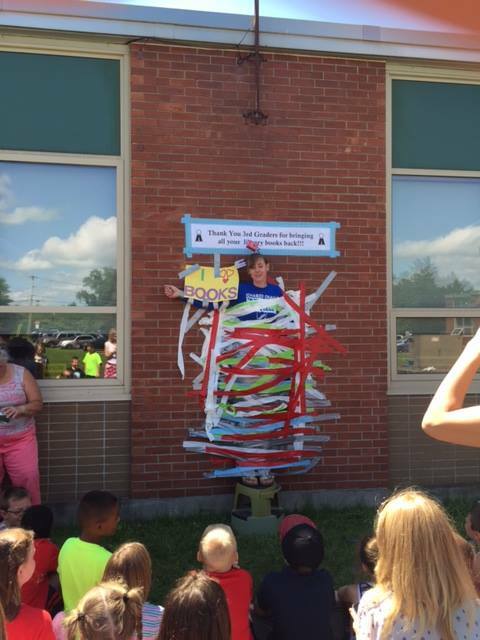 Those kids think their school librarian is a hoot. Great job, great spirit. And a huge hat tip to that incredible aide, Lori, for hatching the idea. Note: Yes, there’s actually a brief video of the moment when they removed the foot stool from beneath Alanna’s feet and — what joy, what laughter — she stuck!